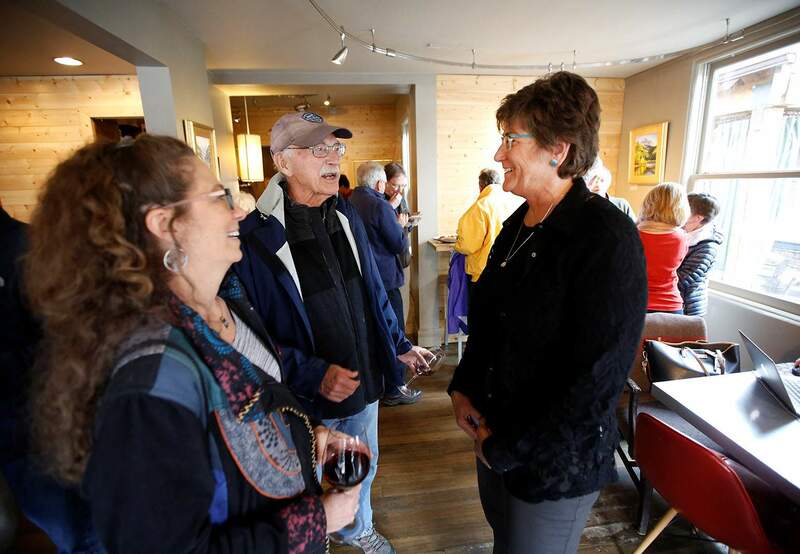 La Plata County Commissioner Gwen Lachelt, right, meets with Ilana Stern and John Edens, among other supporters earlier this month at Eno Wine Bar & Cocktail Lounge, to talk about the recall effort against her. Conservation Colorado, an environmental nonprofit, was the biggest spender in the citizen-driven effort to force a recall election against La Plata County Commissioner Gwen Lachelt. The latest campaign-finance report from United Against the Recall, the issue committee formed by the group and solely funded by it, shows no new donations from April 17 to May 17 and only $9.03 of cash on hand. Conservation Colorado had donated $47,110 to United Against the Recall since February in an effort to combat efforts by three county residents – David Peters, Ty Hawkins and Michael Cugnini – to oust Lachelt. “Given that Commissioner Lachelt was elected twice by La Plata County voters, we aren’t surprised with the outcome and are happy this divisive effort is over,” Jace Woodrum, communication director for Conservation Colorado, said in an email. Woodrum said the voters elected Lachelt twice, and they want to see her continue to serve the county to the end of her term. “We spoke to thousands of voters over the past several months, and they want leaders like Commissioner Lachelt who will prioritize the protection of our Colorado way of life. Our social media and field organizing efforts helped us tell voters about Gwen’s record,” he said. By comparison, La Plata County Recall, the committee formed by supporters of Lachelt’s recall, show a total of $5,068 in monetary contributions and $6,528.42 in non-monetary contributions in campaign contribution and expenditure reports since the committee was formed in January. Non-monetary contributions include voluntary efforts to help the campaign. La Plata County Recall reports a deficit of $182.75 in an amended contribution and expenditures report filed May 14. La Plata County for Gwen Lachelt, Lachelt’s own issue committee, reported no new contributions between April 12 and May 11 and expenditures of $3,224.37. It had $3,867.64 in cash on hand as of May 16. The committee must file a report again June 15. Lachelt’s website for her campaign, “Decline to Sign,” provided information about how people could remove their name from the petition if they thought they had been misled into signing it or if they regretted signing it. La Plata County Clerk and Recorder Tiffany Parker said two people actively went to her office to remove their names from the petition. On Wednesday, Parker reported that recall supporters fell 36 valid signatures short of the 7,505 needed to force a recall election against the commissioner.